Models these days! Sheesh! I was all geared up to show you the other project I found online that I've been lovin' lately but my model was a little moody today. Something to do with finals and messy hair. I try to understand the workings of a 14 year old's brain, really I do, but I just needed her arm in the photo - it's not like her arm hairs were messy. Oh well, I will try again tomorrow. In the meantime, I've got a lot of response from my last post. I guess the "tie"-rific statement was clever and not cheesy after all. Who knew?! So, if you are looking for other Father's Day ideas here's two from last year. I realized I had labeled them under "scrapbooking" instead of "Father's Day" so you may have missed them. 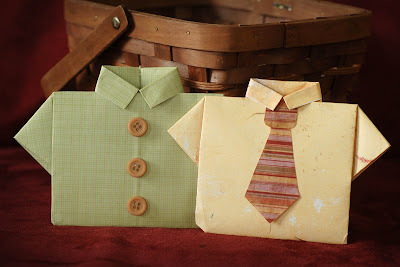 fold up an origami paper shirt for dad, decorate the front and pop a gift card inside. Easy! This one is fun too as you could have the kiddos help you out. They could each take a page and write a message or draw a picture for dad. You could also turn it into a little scrapbook with photos and such. I'm still trying to decide what to get my own dad for Father's day - any suggestions?